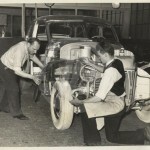 Here's A Vintage Picture Showing The Assembly of the 1939 Pontiac - Before It Went On Public Display. (picture from Glenn Brummer). 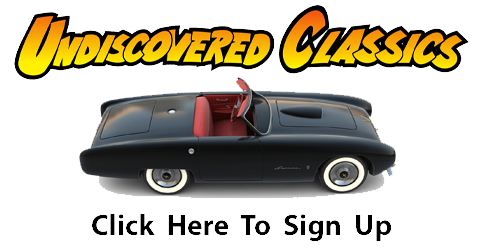 I just looked at your web site and saw the article about the ’41 Ford being described as the first plastic car – that honor should probably go to General Motors, Fisher Body and Rohm & Haas. 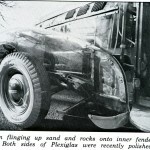 They built two clear Plexiglas bodied cars, one in 1939 (later modified to a 1940) and the other built in 1940. 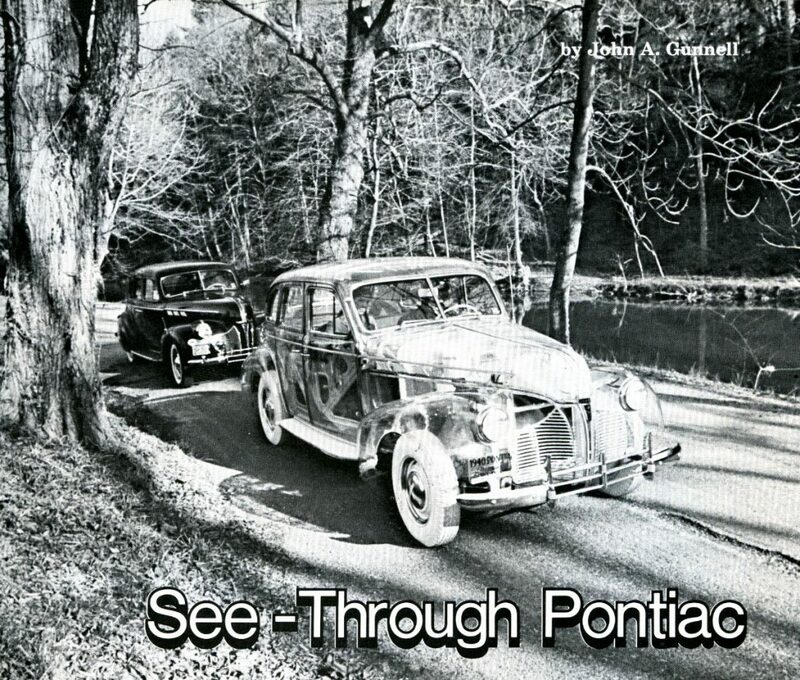 These Pontiac display cars were shown all over the country. One was owned by Frank Kleptz of Terre Haute, IN and may be the same car that Jay Leno now owns OR Frank still owns his and Jay Leno found the second car. 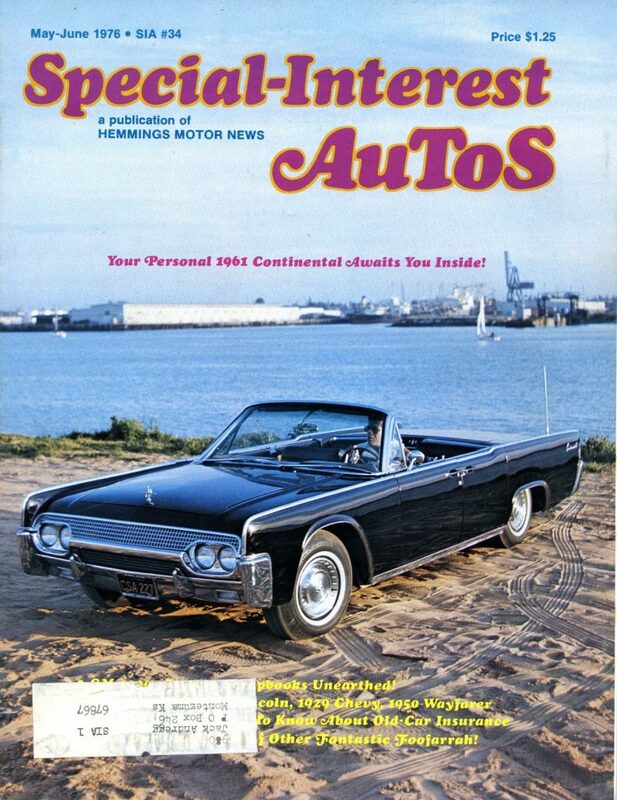 Years ago, Frank brought his car to the Hoosier Auto Show and Swap Meet, when it was being held at the Indianapolis Motor Speedway – I took a picture of it, had it enlarged and sent it to Rohm & Haas who used it to grace the cover of one of their Rohm & Haas Reporter magazines. I’m attaching some pix. Is This The First Plastic Car? 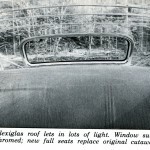 Caption: Plexiglas roof lets in lots of light. Window surrounds are chromed; new full seats replace original cutaway benches. 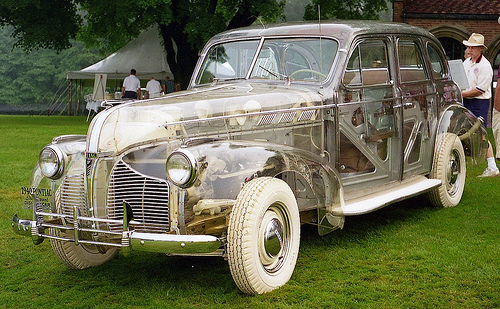 So…is a transparent plastic car used for display “the same as” a painted plastic car used as a concept by Ford in 1941? Close enough for me, gang. I agree with Glenn’s assessment above. Neither car was meant to be used as daily transportation and both were made of our favorite material – plastic – first cousin to fiberglass. So we have a new winner – by nearly two full years. 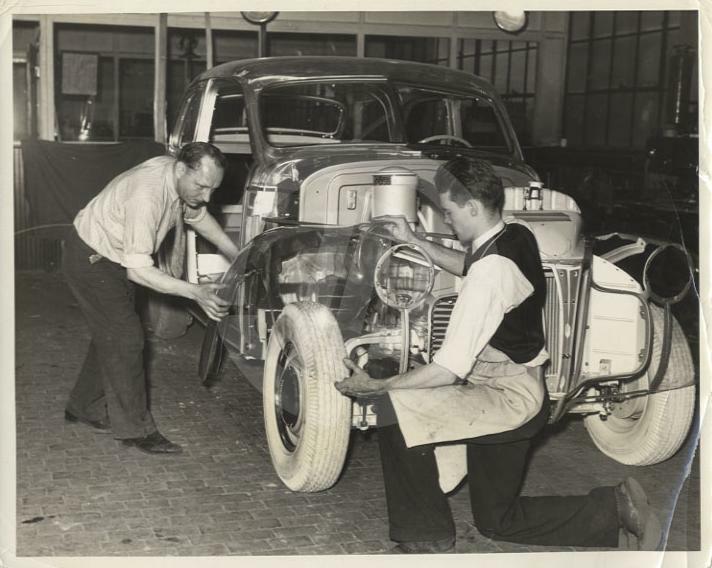 The first plastic car in the world was the 1939 Pontiac built by General Motors. 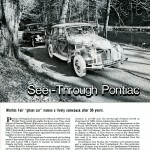 Luckily, there is an excellent article on these transparent cars – written by John Gunnell for Special Interest Autos back in 1976. 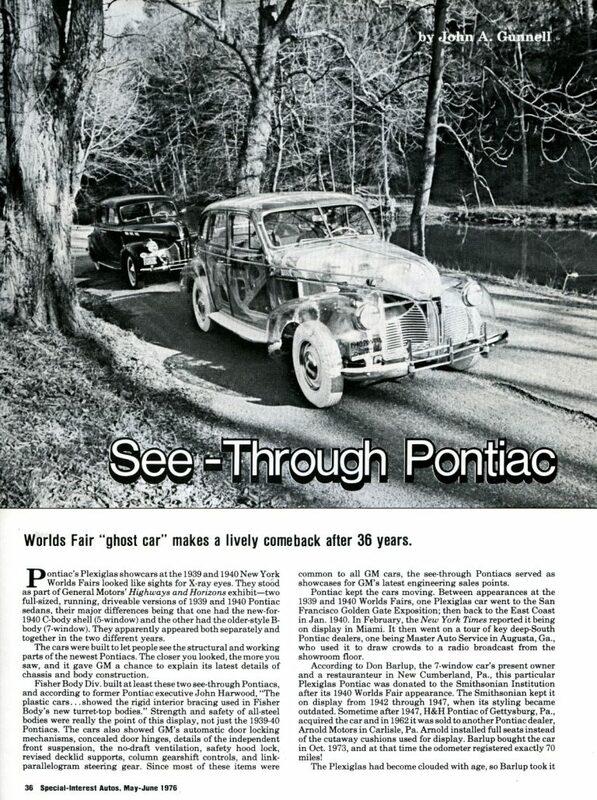 Let’s turn the reins over to John and see what he had to say about the “Plastic Pontiac” back then. 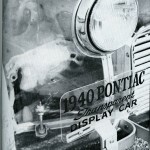 Pontiac’s Plexiglas showcars at the 1939 and 1940 New York World’s Fairs looked like sights for X-ray eyes. 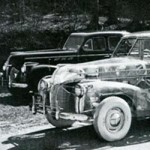 They stood as part of General Motors’ Highways and Horizons exhibit – two full-sized, running, driveable versions of 1939 and 1940 Pontiac sedans, their major differences being that one had the new-for-1940 C-body shell (5 window) and the other had the older-style B-body (7 window). They apparently appeared both separately and together in the two different years. Caption: Speed must remain low to keep tires from flinging up sand and rocks onto inner fender surfaces. 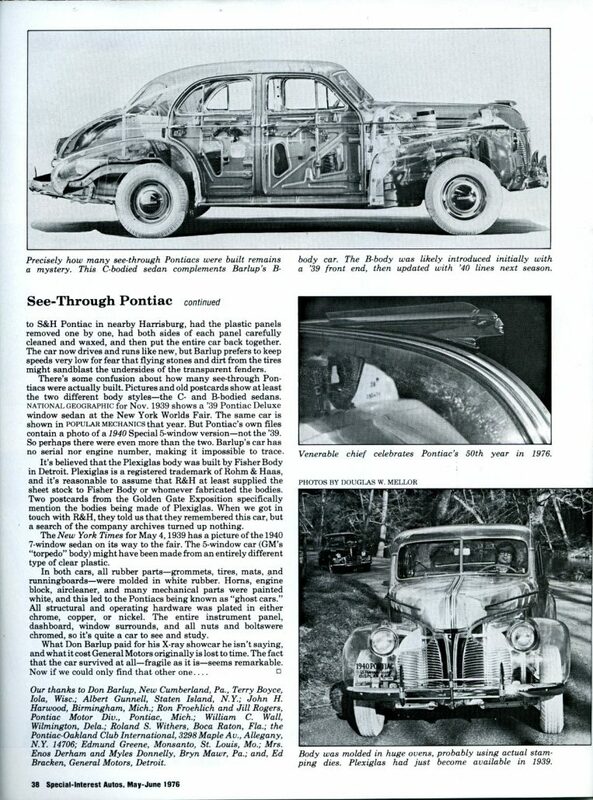 Strength and safety of all-steel bodies were really the point of this display, not just the 1939-40 Pontiacs. The cars also showed GM’s automatic door locking mechanisms, concealed door hinges, details of the independent front suspension, the no-draft ventilation, safety hood lock, revised decklid supports, column gearshift controls, and link-parallelogram steering gear. Since most of these items were common to all GM cars, the see-through Pontiacs served as showcases for GM’s latest engineering sales points. Pontiac kept the cars moving. Between appearances at the 1939 and 1940 World’s Fairs, one Plexiglas car went to the San Francisco Golden Gate Exposition; then back to the East Coast in January 1940. In February, the New York Times reported it being on display in Miami. It then went on a tour of key deep-South Pontiac dealers, one being Master Auto Service in Augusta, Georgia who used it to draw crowds to a radio broadcast from the showroom floor. 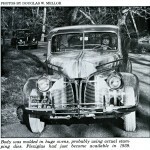 According to Don Barlup, the 7-window car’s present owner and a restaurateur in New Cumberland, Pa., this particular Plexiglas Pontiac was donated to the Smithsonian Institution after its 1940 World’s Fair appearance. The Smithsonian kept it on display from 1942 through 1947, when its styling became outdated. 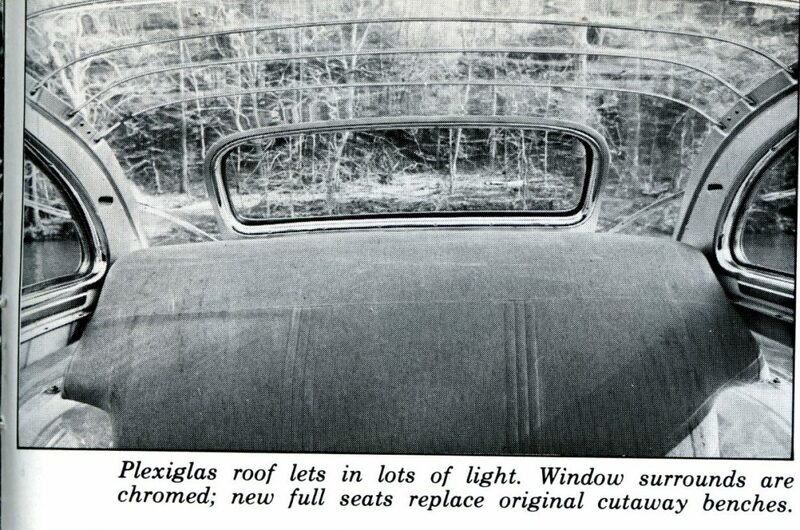 Sometime after 1947, H&H Pontiac of Gettysburg, PA., acquired the car and in 1962 it was sold to another Pontiac dealer, Arnold Motors in Carlisle, PA. Arnold installed full seats instead of the cutaway cushions used for display. Barlup bought the car in October 1973, and at that time the odometer registered exactly 70 miles! 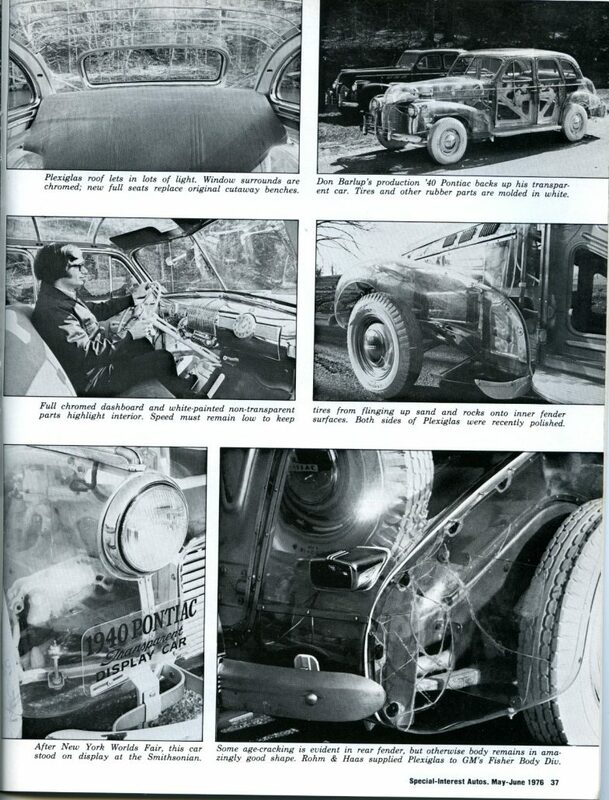 The Plexiglas had become clouded with age, so Barlup took it to S&H Pontiac in nearby Harrisburg, had the plastic panels removed one by one, had both sides of each panel carefully cleaned and waxed, and then put the entire car back together. The car now drives and runs like new, but Barlup prefers to keep speeds very low for fear that flying stones and dirt from the tires might sandblast the undersides of the transparent fenders. 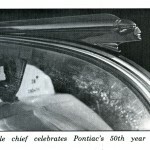 Caption: Precisely how many see-through Pontiacs were built remains a mystery. This C-bodied sedan complements Barlup's B-body car. 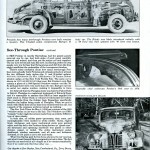 The B-body was likely introduced intially with a '39 front end, then updated with '40 lines next season. 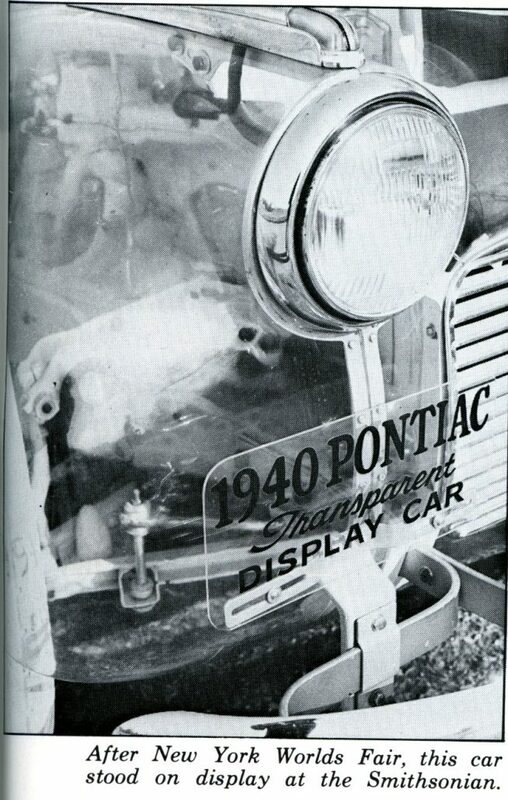 There’s some confusion about how many see-through Pontiacs were actually built. Pictures and old postcards show at least the two different body styles – the C and B-bodied sedans. National Geographic for November 1939 shows a ’39 Pontiac Deluxe window sedan at the New York World’s Fair. 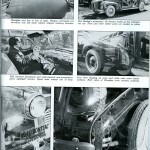 The same car is shown in Popular Mechanics that year. 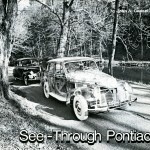 But Pontiac’s own files contain a photo of a 1940 Special 5-window version – not the ’39. So perhaps there were even more than the two. Barlup’s car has no serial nor engine number, making it impossible to trace. 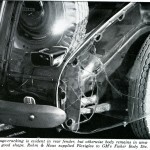 It’s believed that the Plexiglas body was built by Fisher Body in Detroit. 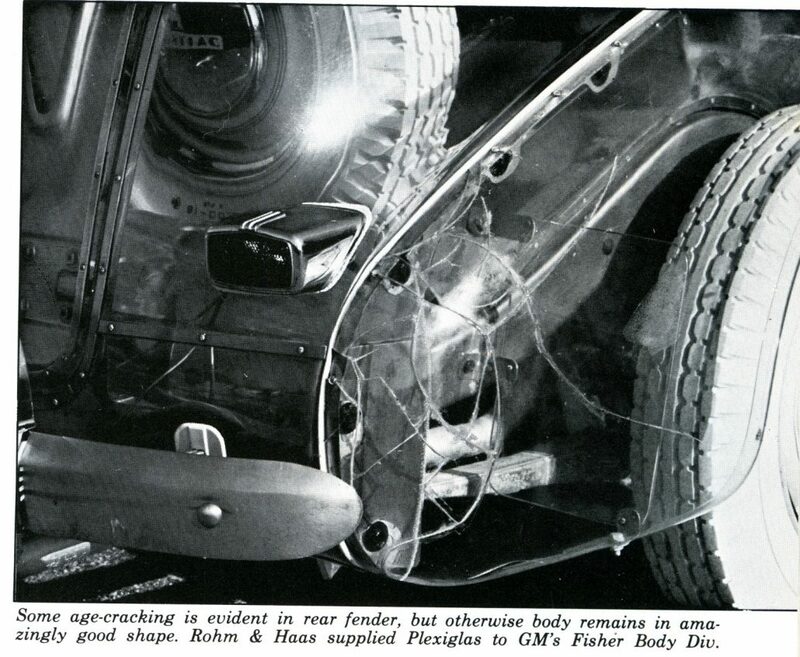 Plexiglas is a registered trademark of Rohm & Haas, and it’s reasonable to assume that R&H at least supplied the sheet stock to Fisher Body or whomever fabricated the bodies. Two postcards from the Golden Gate Exposition specifically mention the bodies being made of Plexiglas. When we got in touch with R&H, they told us that they remembered this car, but a search of the company archives turned up nothing. 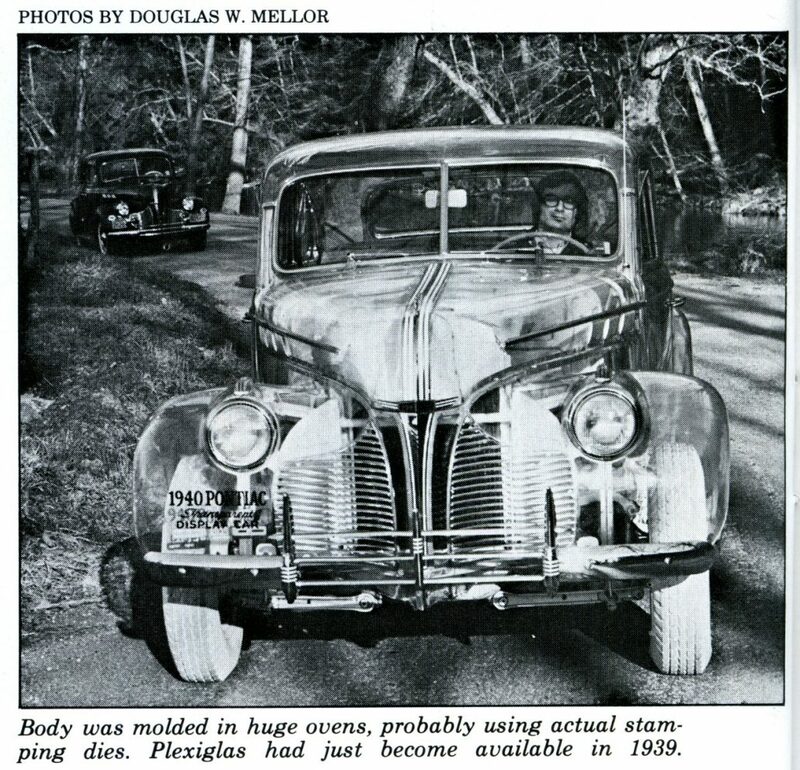 The New York Times for May 4th, 1939 has a picture of the 1940 7 window sedan on its way to the fair. 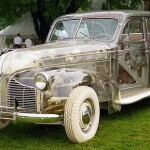 The 5 window car (GM’s “torpedo” body) might have been made from an entirely different type of clear plastic. Caption: Body was molded in huge ovens, probably using actual stamping dies. 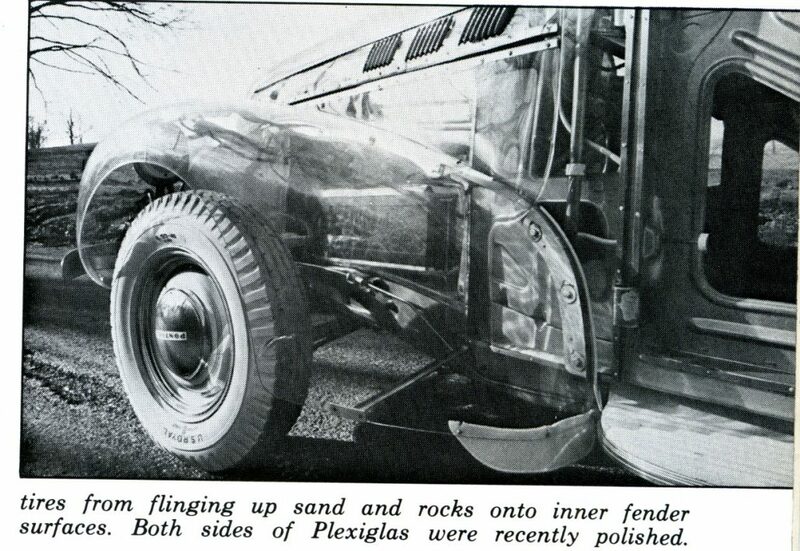 Plexiglas had just become available in 1939. 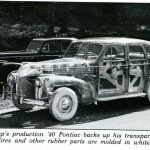 In both cars, all rubber parts – grommets, tires, mats, and running boards – were molded in white rubber. Horns, engine block, air cleaner, and many mechanical parts were painted white, and this led to the Pontiacs being known as “ghost cars.” All structural and operating hardware was plated in either chrome, copper, or nickel. 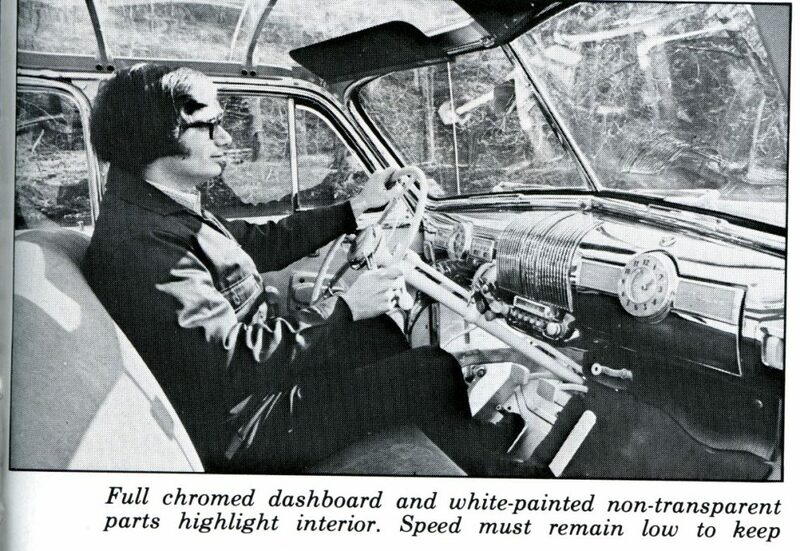 The entire instrument panel, dashboard, window surrounds, and all nuts and bolts were chromed, so it’s quite a car to see and study. What Don Barlup paid for his X-ray showcar he isn’t saying, and what it cost General Motors originally is lost to time. The fact that the car survived at all – fragile as it is – seems remarkable. 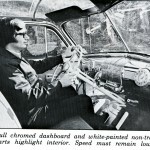 Thanks to Daniel Strohl of Hemmings for permission to reprint this article from their SIA archives – and to John Gunnell for his excellent research on this car back in 1976. Interesting, the car will be coming up for auction later this summer. Click here to read more about the car and its history via another story by Daniel Strohl at the Hemmings Blog. 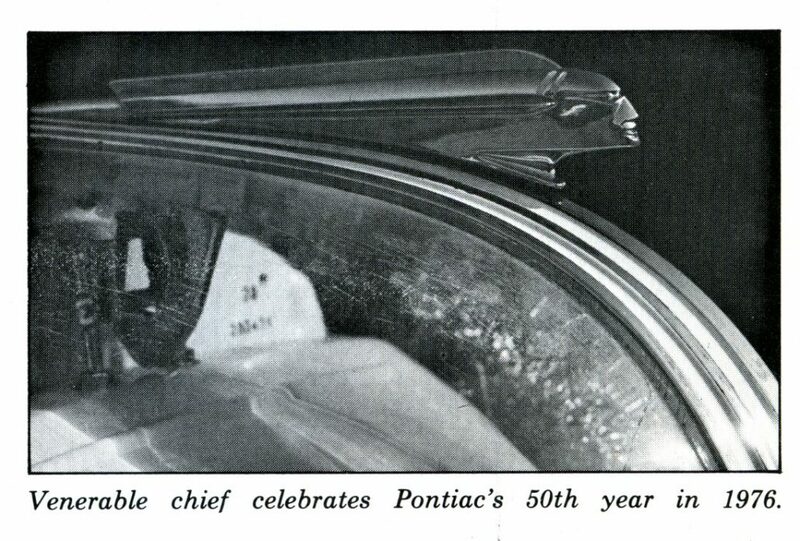 Caption: Precisely how many see-through Pontiacs were built remains a mystery. This C-bodied sedan complements Barlup’s B-body car. 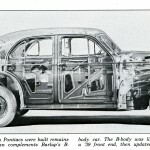 The B-body was likely introduced intially with a ’39 front end, then updated with ’40 lines next season. 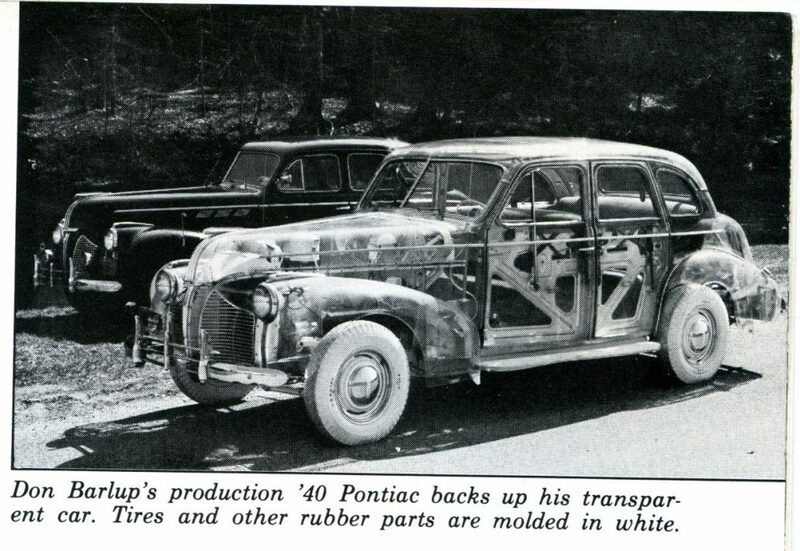 Here’s A Vintage Picture Showing The Assembly of the 1939 Pontiac – Before It Went On Public Display. (picture from Glenn Brummer). 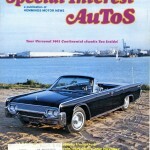 I remember seeing this car at our Pontiac showroom in Beaunmont Texas when I was nine (or ten) as a kid..